RALEIGH, N.C. — Tampa Bay Lightning coach Jon Cooper put Ryan Callahan back in the lineup for the first time in nearly two weeks on Thursday. Nino Niederreiter, Dougie Hamilton and Jordan Staal scored for the Hurricanes. 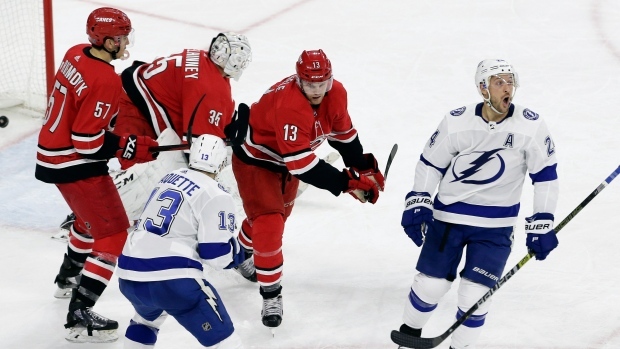 Staal's go-ahead goal in the second period came after he returned from hit to the head from Lightning centre Yanni Gourde, who was given a match penalty and ejected. After Erik Cernak got called for tripping and Warren Foegele was sent off for embellishment to create a four-on-four, Cirelli tied the score when he fought through a tie-up with Teuvo Teravainen to get just enough of Stamkos' centring pass and push it into the net.